White Card (Australia) Course Online From Just $38.50! Start 24/7! Get your White Card Online Any Time - 24/7, only $38.50! Our Average Trainee Takes Just 5 Hrs to Complete This Course! The course is delivered completely online in the convenience of your home or office. It generally takes about 5 hours in one sitting, however you can log off and on as many times as you want and it will initiate the course where you last stopped. The new CPCCWHS1001 (WA) white card course is $38.50 AUD, Paid using Visa (including Visa Debit) or Mastercard through secure online merchant account. What do I have to do to complete my course? Once all of the above is completed, we will then post your card via surface mail within 3-5 working days, faster if you opt for our Priority Service Upgrade option where your card is processed within 1 to 2 days (usually 1) and sent out in an Express Post envelope. You will have the option to choose this when you register. The National White Card (CPCCWHS1001: Prepare to work safely in the construction industry) replaces and updates all other previous construction Induction cards in Australia AND allows you the convenience of using one card ACROSS ALL BORDERS. Previous cards such as Blue Card, Red Card, Green Card are now replaced by the White Card. One of the most frequent questions we get about our Construction White Card, is "Is it valid in my State". The simple answer is "Yes". Due to legislative changes and new OHS harmonisation principles put in place in January 2012, the White Card must now be accepted in all States. Whilst local Worksafe and Workcover authorities have in some cases had their own views within their local jurisdictions, the new regime of legislation is quite clear. For a more detailed treatment of State compliance please visit Is The White Card Valid in My State? Another question we get is "how soon can I go onto a construction site?". The process for receiving your Construction Induction Card is described in other sections of this website, but essentially entails you sending your completed documentation into us (either by scanning and emailing, or postage). Once this has been received and validated, we typically send out your White Card within 1 to 3 working days by normal mail. Of course, you will receive a Statement of Attainment certificate immediately you've passed your course online. However, we do not encourage our trainees to use this certificate to try and get access to a construction site. In some cases, you may be allowed access, but in many cases you won't and this approach is not without reasonable cause, as your ID and observer Statutory Declaration forms have not yet been validated by us as the RTO. Another relevant question is "What are the responsibilities of different personnel on a construction site?" The model WHS Regulations require the person that commissions construction work to consult with the designer of a structure about safety matters and to give the designer and the principal contractor for the project information about safety matters. A PCBU that carries out construction work must manage and control WHS risks associated with that work. It must also ensure that a construction site is secured from unauthorised access. The principal contractor for a construction project is also a PCBU and must be aware of the WHS duties that apply to all PCBUs that carry out construction work, as well as the specific duties that are imposed on principal contractors in that industry. Specific duties that apply to principal contractors include, but are not limited to, the duty to be clearly identified by signage posted at the construction site, the duty to prepare, review, keep and inform others about the WHS management plan for the construction project. Under the model WHS Act, the person with management or control of a workplace must ensure, so far as is reasonably practicable, that the workplace, the means of entering and exiting the workplace and anything arising from the workplace are without risk to the health and safety of any person. The model Code of Practice for Construction Work provides practical guidance to achieve the standards of health, safety and welfare required under the model WHS Act and Regulations in relation to construction work. To be able to carry out construction work, a person must complete an introductory safety training course called 'general construction induction training'. This is also commonly known as 'white card' training. Under the model WHS Act, a PCBU must make sure every worker has completed white card training, including those who have completed training in the past but have not carried out construction work in the last two years. 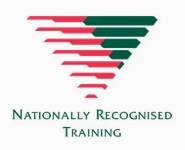 Once a person has completed that training they may apply to a WHS regulator for a white card. A white card issued in one state or territory or by the Commonwealth is generally recognised Australia wide. 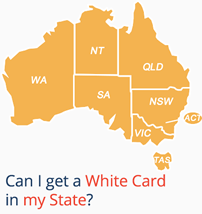 For more information about white card training, cross-border recognition, applications and renewal of white cards, contact the WHS Regulator in your state or territory or the Commonwealth. Some types of construction work-such as operating certain types of cranes or carrying out scaffolding work-require a high-risk work licence. This is another common question we get about the safety induction course we provide online. Legislation requires that the full content normally delivered in a six hour face to face course must be delivered. You will need to add to this the time it takes to get your paperwork completed (ID and declaration). The requirements you have to complete once you've passed the course, are clearly set out on this page of our website. "If you have lost your white card, don't panic! You will not have to re-take the course, simply contact us about our white card replacement option, even if you didn't complete your original white cad course with us!" Due to recent changes to QLD government legislation, the type of white card you will receive has changed. After 31 January 2019, all students who complete the online white card course will receive a WA white card (which is fully accepted in all Australian states and territories). In order to receive a QLD white card, you must complete a classroom-based, face to face course at a QLD location. You may be elidable to receive a QLD white card for online training if you live more than 100km away from the nearest available training centre; Please contact us for more information about remote areas online delivery approval.